Wars among the Greek poli were common in the fifth century before the Common Era, but the city-states united to defend themselves against Persia, the most powerful empire in the world at that time. The victorious Greeks developed a sense of confidence that led to an era we now call the Classical Age of Greece. The Persian Empire conquered Ionia. 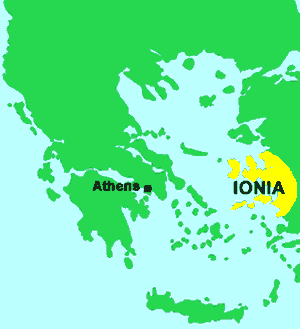 Ionia is east of the Greek peninsula in Asia Minor, land that is now part of the modern nation of Turkey. In 499BCE, Athens sent its army to aid an Ionian rebellion against the Persians. 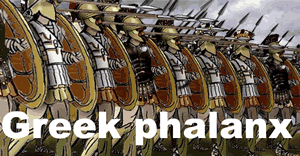 Athens used a battle formation called a phalanx. In a phalanx, heavily armed soldiers held overlapping shields that protected the combatants on either side. The phalanx required soldiers to depend on one another for their safety, so Athenian warriors fought as a unit instead of as individuals. The well-trained Athenian phalanx helped repel the Persians from Ionian land. King Darius of Persia swore revenge on Athens. In 490BCE, Persian ships carried about 20,000 warriors to Marathon, a flat plain twenty-six miles from Athens. The Persians planned to use Marathon as a base from which to attack, but a spy alerted Athens. The Athenian army was outnumbered by about two to one, but they marched through the night to make a surprise attack on the Persian forces at dawn. The frightened Persians fled to their ships and retreated from Greece. A messenger named Pheidippides ran to Athens without stopping to announce Athens’ surprise victory at Marathon, but the runner died from exhaustion shortly after gasping out his news. A modern marathon is a footrace that is named in honor of Pheidippides’ run. Modern marathons are exactly 26 miles, 385 yards, exactly the distance Pheidippides is believed to have run. Ten years after the Persian retreat at Marathon, Darius’ son, Xerxes, prepared for another invasion of Greece. 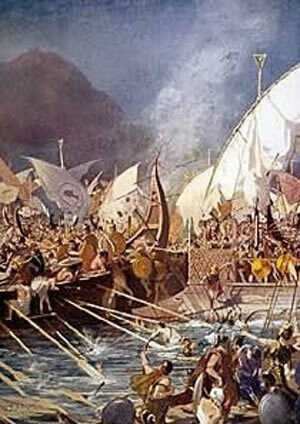 Xerxes sent about 200,000 soldiers and 800 ships to fight the Greeks at the Battle of Salamis in 460BCE. 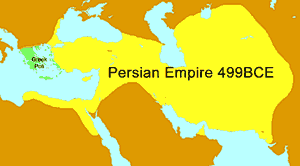 The Persian king watched from a mountaintop as the Greeks managed to destroy the Persian fleet. Xerxes was so enraged by Persia’s loss that he beheaded the few Persian captains who were able to escape the wrath of the Greek armies. Athens had twice resisted the most powerful empire in the world, but Athens was certain that Persia would make another attempt to conquer Greece. Athens asked all of the Greek poli to meet on the island of Delios where the poli formed an alliance known as the Delian League. Each member of the Delian League contributed soldiers, ships and money to fight the Persians. The Delian League used its powers first to punish the poli that supported Persia in the past. Then, the combined forces of the league conquered the remaining Persian territories in Ionia. The united Greeks no longer feared the Persians because the Greeks had enough military power to fend off the powerful empire in the world. Historians call the period the followed the Greek victories over the Persians the Classical Age of Greece. During the classical age, artists, poets, sculptors and architects developed a culture that was unique to Greece. Sparta and Athens were the two most powerful poli of the Classical Age. Sparta was a disciplined military power that discouraged traveling and visitors. 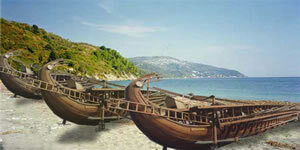 Athens was a port city whose merchant ships traveled throughout the Mediterranean Sea. In time, the rivalry between Sparta and Athens would lead to the end of the Classical Era. View a Powerpoint presentation of this lesson. Listen as Mr. Dowling reads this lesson. The Greeks destroyed the Persian fleet in battle of Salamis in 460BCE. Ionia is east of the Greek peninsula on land that is part of the present-day nation of Turkey. The Athenian soldiers used a battle formation called a phalanx to defeat the powerful Persian Empire. 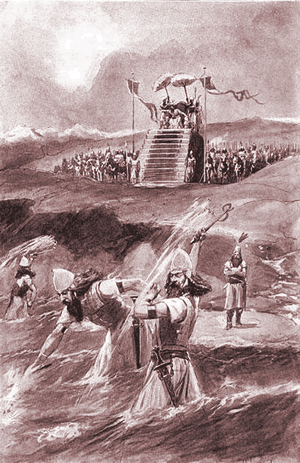 Herotodus wrote that Xerxes ordered the sea to be whipped by his soldiers when a storm kept the Persian emperor’s navy from crossing the Hellespont. Athens sent its army to aid an Ionian rebellion against the Persians.